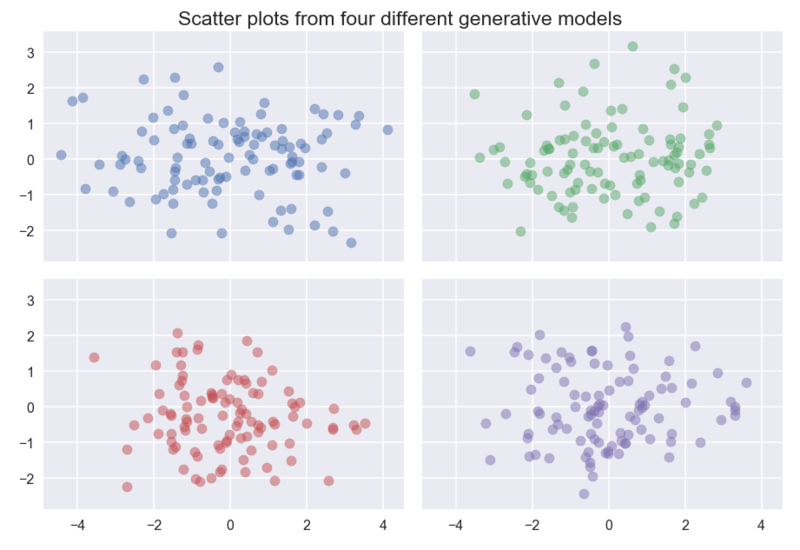 Four different generative models, when sampled, produce results that are hard to easily differentiate. The blue dataset is sampled from a mixture of three standard Gaussians centered at (-2, 0), (0,0) and (2,0); the green dataset is sampled from a mixture of two standard Gaussians centered at (-1,0) and (1,0); the red data is sampled from a multivariate Gaussian with covariance [2, 0; 0 1]; the purple data is a single standard Gaussian with uniform background noise. The Haversine metric as implemented supports coordinates in radians. That means you’ll need to convert your latitide and longitude data into radians before passing it in to HDBSCAN.